Healthcare Professionals - NxStage Medical UK Ltd.
NxStage’s products and therapies can help healthcare professionals and their patients across the entire continuum of haemodialysis care. NxStage has innovative, cost-effective solutions for renal care that focus on patient quality of care, which reduces the workload on staff. 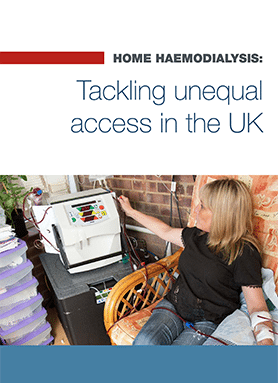 In the UK, we face a postcode lottery that sees huge discrepancies in which kidney patients are offered home haemodialysis as a treatment option. At NxStage, we specialise in home haemodialysis treatments that provide simplicity, flexibility, and portability without compromising safety. System One was designed to overcome the challenges posed by traditional equipment and is the first truly portable haemodialysis system for home and clinic use. Flexible therapy options allow patients to perform therapy during the day or while they sleep.